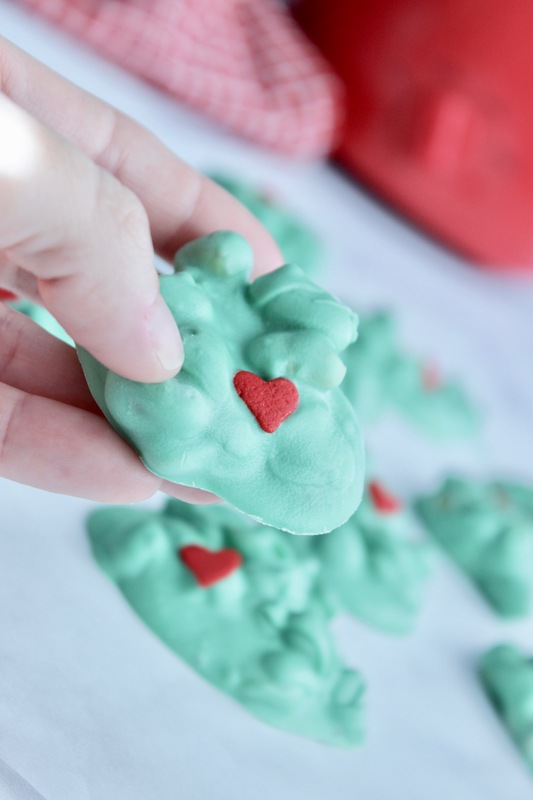 I have been absolutely loving making crockpot candy this year! My freezer is FULL of sweet treats and we’re not even half way into the month yet! 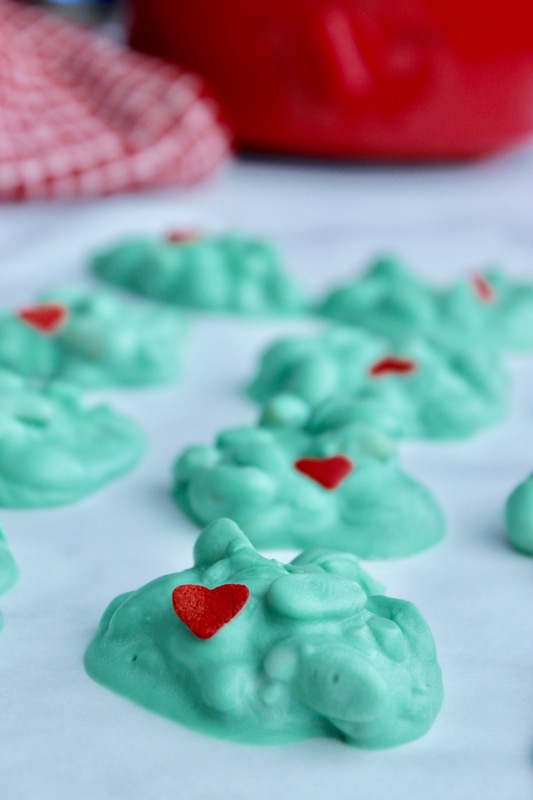 Now, these Dr. Seuss Grinch Cookies? They’re absolutely adorable and just as tasty, too. The older I get, the more I realize that the Christmas season is oodles more fun when you’re ahead of the game. There is absolutely nothing fun about being behind the eight ball when it comes to Christmas. 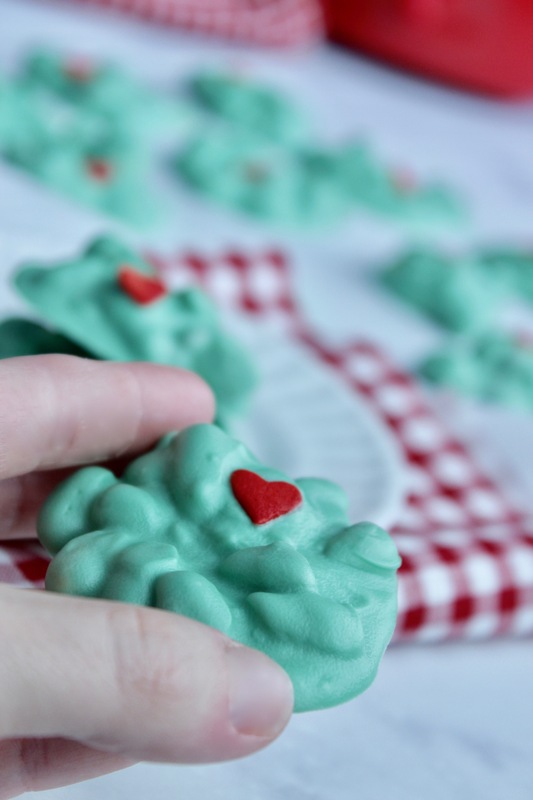 That’s why I am totally loving these Dr. Seuss Grinch cookies. I guess you could call them more of a Dr. Seuss Grinch Candy maybe? They’re a peanut chocolate mix of goodness that comes together in mere minutes it seems. In fact the hands on time on these is literally just 15 minutes. Since the chocolate and peanuts are made in the crockpot it’s literally dump and go. I love that about crockpot peanut clusters! 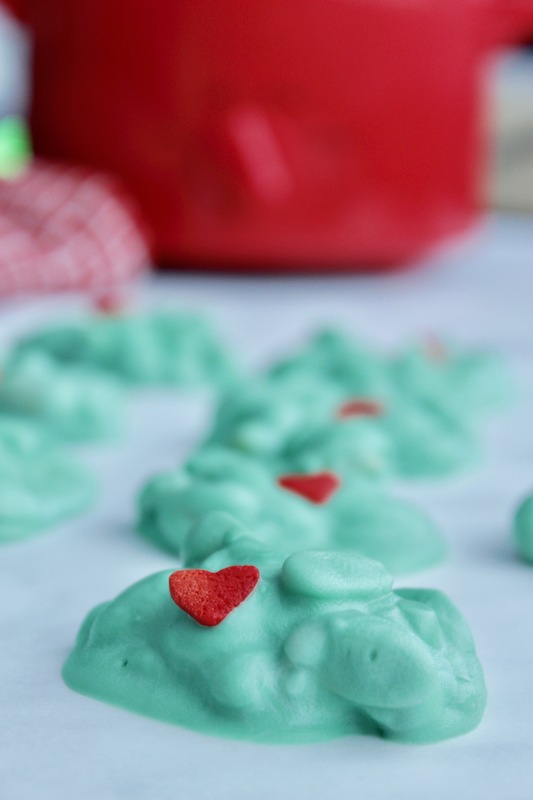 To whip this Dr. Seuss Candy up you’ll layer four ingredients in the crock pot. First, pour the peanuts in the crockpot. You’ll need two cups. Next, lay in a half bar of white chocolate baking chocolate (yum!). 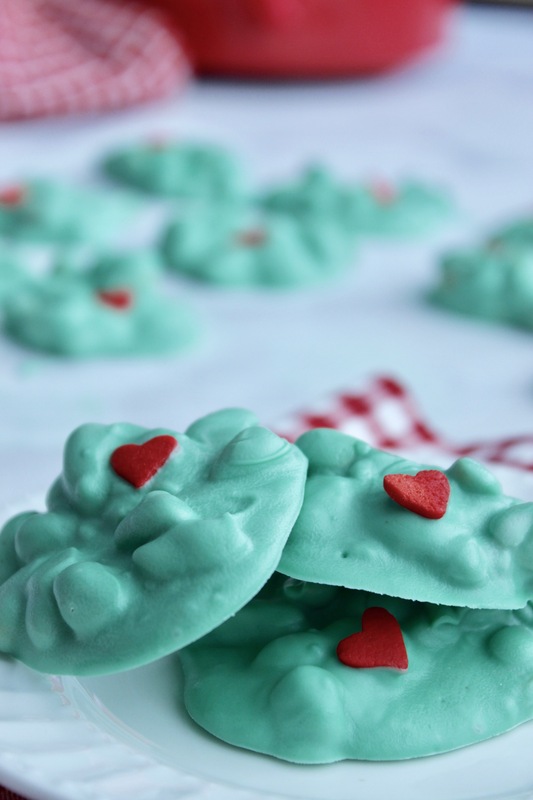 Add in a package of Green Wilton Candy Melts and some white almond bark and you’re off to the races. Let that melt for one hour. But, but, but (and this is probably the most important part of this recipe) Lay a paper towel over the crockpot and under the lid. Be careful to make sure that the paper towel doesn’t go in the actual peanut and chocolate mixture, but do put this over the crockpot ( and under the lid). This will prevent condensation from getting into the crockpot causing the clusters to get hard and chunky. If condensation gets into the chocolate mixture you will not like how your clusters turn out. They will not look like the ones in my pictures here. Once you’ve checked your chocolate mixture after an hour, you’ll want to determine if it needs any more time. If not, great, give it a good stir. If so, set your timer in 15 minute increments and stir every 15 minutes. Once the chocolate mix is all softened, roll out a piece of parchment paper and get to making the clusters. I find that using an ice cream scoop or a 1/4 cup measuring cup works really well at getting the clusters just the right size. 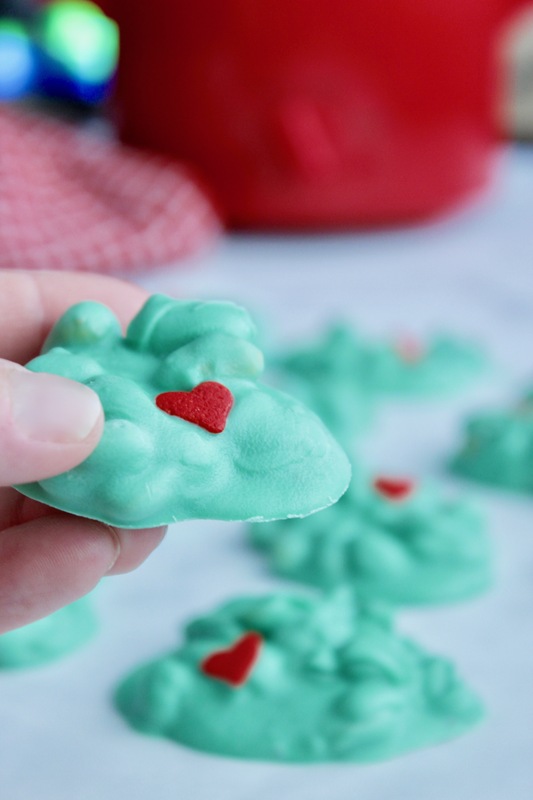 I have been absolutely loving making crockpot candy this year! My freezer is FULL of sweet treats and we're not even half way into the month yet! 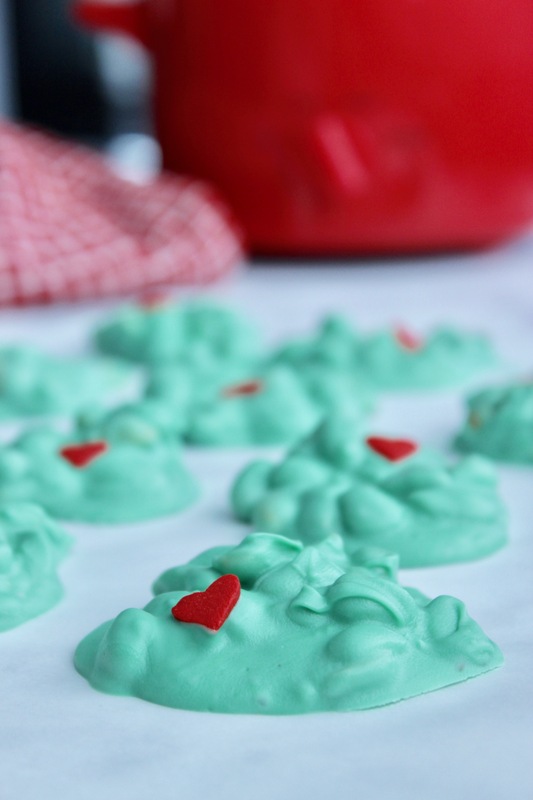 Now, these Dr. Seuss Grinch Cookies? They're absolutely adorable and just as tasty, too.